Residents of Darien residents can now can rent kayaks and paddleboarding at Weed Beach, starting Memorial Day weekend and continuing through the summer. The partnership between the Darien Parks & Recreation Department and Downunder LLC, will begin on Memorial Day Weekend. Colorful kayaks and paddle boards will be lined up on the beachfront from 10 a.m. to 4 p.m. for weekends until June 18 (two days after the last day of Darien schools and a day after Weed Beach Fest) and then daily through Labor Day. “This is an idea that has been kicked around for quite a few years and we are proud to have made it a reality this year,” said Pamela Gery, Darien Parks and Recreation Director. In addition to rentals, Downunder will also have paddleboard yoga classes. Rentals start at $35, lessons $60, yoga $45 and tours $65. 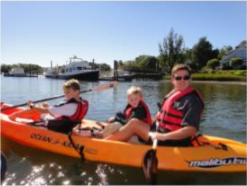 “We are thrilled to have the opportunity to work with the Darien Parks and Recreation Department to offer kayak tours, lessons and rentals along with paddle board rentals, lessons and classes,” said Kim Hawkins, owner of Downunder, LLC, who has two other operations in Westport and Rowayton. Registration for the new "SUP Youth" (stand up paddleboard) classes for ages 11 to 14 is currently open with registration online at the Darien YMCA website or at the Front Desk. ___________ — an announcement from Darien YMCA ___________ SUP Youth offers two classes: SUP Yoga and SUP Fitness.